spasmodic, choking, or suffocative pain; now used almost exclusively to denote angina pectoris. adj., adj an´ginal. crescendo angina old term for unstable angina. herpes angina (angina herpe´tica) herpangina. intestinal angina generalized cramping abdominal pain occurring shortly after a meal and persisting for one to three hours, due to ischemia of the smooth muscle of the bowel. Ludwig's angina see ludwig's angina. angina pec´toris acute pain in the chest resulting from myocardial ischemia (decreased blood supply to the heart muscle); the condition has also been called cardiac pain of effort and emotion because the pain is brought on by physical activity or emotional stress that places an added burden on the heart and increases the need for blood being supplied to the myocardium. Some patients can predict the kinds of events that will precipitate an attack while others are unaware of any relationship between onset of an attack and any particular situation in their lives. Angina pectoris occurs more frequently in men than in women, and in older persons than in younger persons. It is not a disease entity but a symptom of an underlying disease process involving the arteries that supply blood to the heart muscle. About 90 per cent of all cases can be attributed to coronary atherosclerosis. Studies have shown that at least one of the three major coronary arteries usually is stenosed before angina develops. In most cases, all of the major coronary arteries are involved. Angina pectoris also can result from stenosis of the aorta, pulmonary stenosis and ventricular hypertrophy, or connective tissue disorders such as systemic lupus erythematosus and periarteritis nodosa that affect the smaller coronary arteries. Symptoms. The chief symptom is chest pain, usually unmistakably distinguished by the patient as different from other types of pain such as that caused by indigestion. It is generally described as a feeling of tightness, strangling, heaviness, or suffocation and is usually concentrated on the left side, beginning just under the sternum; it sometimes radiates to the neck, throat, and lower jaw and down the left arm, and occasionally to the stomach, back, or across to the right side of the chest. The pain seldom lasts more than 15 minutes and is usually relieved by rest and relaxation or by administration of nitrates. If it is not relieved in 10 to 15 minutes, the physician should be notified and the patient taken to a cardiac care unit. The decreased blood supply to the heart makes it especially vulnerable to arrhythmias and myocardial infarction, which are the cause of death in about one third of all cases. Coronary arteriography and ventriculography are valuable in determining the prognosis for angina pectoris. The mortality rate for patients having a narrowing of all three main coronary arteries is higher than for those who have only one vessel involved. Severity of pain is not a good prognostic indicator; some patients with severe discomfort live for many years, while others with mild symptoms die suddenly. An enlarged heart, a third heart sound, ECG abnormalities at rest, and hypertension are all indicative of a poor prognosis. Treatment and Patient Care. Relief from pain by rest and prevention of attacks by avoiding situations which precipitate them are the first steps in the care of the patient with angina. In most cases patients are eager to learn about the disease process causing the pain and want to know how they can participate in control of their attacks. However, compliance with the prescribed regimen usually requires a change in life style and the breaking of some lifelong habits. The known risk factors for coronary heart disease are explained to the patient, and a regimen designed to avoid further damage to the arteries is prescribed. Organic nitrates may be administered orally or sublingually for relief from anginal pain. They act by dilating the arteries and may be used to treat acute attacks, for long-term prophylaxis and management, or for prophylaxis in situations likely to provoke an attack. Commonly used nitrates are erythrityl tetranitrate, isosorbide dinitrate, and nitroglycerin. Beta-adrenergic blocking agents, such as propranolol, are used to treat patients who do not respond to weight control and treatment with vasodilators and whose angina significantly limits their activities. These agents decrease the heart rate, blood pressure, and myocardial oxygen consumption and increase the patient's exercise tolerance. The calcium channel blocking agents (nifedipine, verapamil, diltiazem, and others) are drugs that are particularly beneficial in relieving pain in patients whose angina is the result of coronary artery spasm or constriction. They act by selectively inhibiting the transport of calcium across the cell membrane of myocardial cells and also by reducing myocardial oxygen utilization. Patients most likely to obtain dramatic relief from drugs of this kind are those who experience chest pain while resting or sleeping, upon exposure to cold, or during emotional stress. Surgical procedures involving arterial bypass and angioplasty have become fairly common as a form of treatment of certain types of ischemic heart disease and resulting angina pectoris. The surgical procedures attempt to bypass the diseased portion of the coronary artery by suturing a vein graft or the internal mammary artery from the aorta to one or more coronary arteries beyond the area of obstruction. In most instances the graft is obtained from the patient's saphenous vein. Angioplasty reestablishes patency of the vessels; in most cases, it is now accompanied by insertion of a stent to help prevent restenosis. An attitude of calmness and efficiency is most important when caring for a person suffering from an attack of angina pectoris. The pain produces emotional reactions and the strongest of these is fear. Most of these patients know that their pain is resulting from an insufficient supply of oxygen to the heart and they frequently have a feeling of impending death. It usually helps to raise the patient to a sitting position so that breathing is less difficult. The prompt administration of nitroglycerin or the specific drug ordered by the physician should shorten the attack and relieve pain. Above all, the calm presence of someone who knows how to care for them can do much to reassure patients and help them relax, thus lessening the severity of the attack. Plaut's angina necrotizing ulcerative gingivostomatitis. preinfarction angina angina that lasts longer than 15 minutes; it is a symptom of worsening cardiac ischemia. Prinzmetal's angina a variant of angina pectoris in which the attacks occur during rest, exercise capacity is well preserved, and attacks are associated electrocardiographically with elevation of the ST segment. It is cyclic in nature and is believed to be caused by coronary artery spasm. pseudomembranous angina necrotizing ulcerative gingivostomatitis. stable angina chest pain of cardiac origin that has not changed in character, frequency, intensity, or duration for 60 days. unstable angina chest pain of cardiac origin that is variable, usually increasing in frequency and intensity and with irregular timing. Vincent's angina see vincent's angina. severe constricting pain or sensation of pressure in the chest, often radiating from the precordium to a shoulder (usually left) and down the arm, resulting from ischemia of the heart muscle usually caused by coronary disease. Severe paroxysmal pain in the chest associated with an insufficient supply of blood to the heart. a paroxysmal thoracic pain caused most often by myocardial anoxia as a result of atherosclerosis or spasm of the coronary arteries. The pain usually radiates along the neck, jaw, and shoulder and down the inner aspect of the left arm. It is frequently accompanied by a feeling of suffocation and impending death. 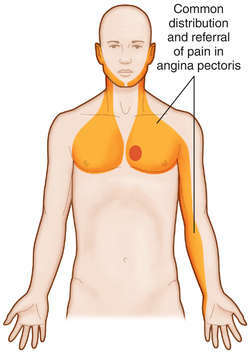 Attacks of angina pectoris are often related to exertion, emotional stress, eating, and exposure to intense cold, but unstable angina can occur in the absence of a stimulus or exertion. The pain may be relieved by rest and vasodilation of the coronary arteries by medication, such as nitroglycerin. Also called cardiac pain. observations The chief symptom of stable angina is a highly variable, transient, substernal pain that typically starts with physical or emotional exertion and subsides with rest. It may range from a vague ache to an intense crushing sensation. Radiation to the left shoulder, arm, or jaw or to the back is common but does not occur in all cases. Attacks are exacerbated by cold. The most severe class of angina is a constant pain even at rest. Symptom patterns tend to be consistent and stable for a given individual. Any change in symptom patterns, such as an increase in attack frequency or intensity, should be viewed as serious. Such changes are known as unstable angina and are associated with the deterioration of atherosclerotic plaque. The pain in unstable angina is frequently not fully relieved by rest. Unstable angina is often a precursor to myocardial infarction. Tests include a stress test to deliberately induce an angina attack and check for electrocardiographic (ECG) changes. A test dose of nitroglycerin is administered to evaluate the degree of pain relief. Serum lipid and cardiac enzyme levels are evaluated to screen for cardiac risk factors. Nuclear scanning, angiography, and PET may be indicated to check myocardial perfusion and determine the presence of underlying coronary artery disease (CAD). interventions The first line of treatment is aggressive modification of risk factors, such as smoking, obesity, physical inactivity, elevated lipid levels, and elevated blood pressure. Drug therapy focuses on the prevention of myocardial insufficiency and pain relief and includes nitrates, beta-blockers, and calcium channel blockers. Prophylactic aspirin and statins are given for individuals with known CAD, and aspirin and heparin are used to treat intracoronary blood clotting in unstable angina and to prevent progression to myocardial infarction. Coronary artery bypass is used for selected individuals with severe angina, localized CAD, no history of MI, and good ventricular function. Percutaneous coronary intervention may be emergently performed to compress plaque, and a stent may be placed to keep the coronary artery open. Angioplasty may be used to remove obstructive atherosclerotic lesions. Unstable angina necessitates immediate hospitalization, bed rest, and ECG monitoring for possible MI. nursing considerations Nursing plays a large role in reducing risk behaviors through smoking-cessation protocols, dietary modification (low-fat, low-sodium diet with complex carbohydrates and fruits), consistent aerobic exercise routines (three to four times weekly for at least 30 minutes), and stress-reduction activities. Patient education is tailored to the individual's symptom set and includes identification of precipitating factors and education to prevent or control those factors. Education about medication effects and side effects is essential. The individual should be able to recognize and report symptoms of unstable angina. Nursing intervention during an acute attack is aimed at maintaining adequate tissue perfusion and relieving pain, including assessment and monitoring of vital signs and ECG patterns, auscultation of heart and lung sounds, administration of oxygen, and prompt administration of nitrates and narcotic analgesics as needed. Rest and cessation of all activity should occur until pain subsides. The nurse should provide comfortable positioning, and supportive calm reassurance to reduce anxiety. Paroxysmal severe constricting pain or pressure in the chest due to myocardial ischemia; typically radiates from the precordium to one or both shoulders, neck, or jaw; often precipitated by exertion, exposure to cold, or emotional excitement. Patients typically describe a pain or pressure located behind the sternum and having a tight, burning, squeezing, or binding sensation that may radiate into the neck, jaw, shoulders, or arms and be associated with difficulty in breathing, nausea, vomiting, sweating, anxiety, or fear. The pain is not usually described as sharp or stabbing and is usually not aggravated by deep breathing, coughing, swallowing, or twisting or turning the muscles of the trunk, shoulders, or arms. Women, diabetics, and the elderly may present with atypical symptoms, such as shortness of breath without pain. In health care settings, oxygen, nitroglycerin, and aspirin are provided, and the patient is placed at rest. Morphine sulfate is given for pain that does not resolve after about 15 min of treatment with that regimen. Beta-blocking drugs (such as propranolol or metoprolol) are used to slow the heart rate and decrease blood pressure. They are the mainstay for chronic treatment of coronary insufficiency and are indispensable for treating unstable angina or acute myocardial infarction. At home, patients should rest and use short-acting nitroglycerin. Patients with chronic or recurring angina pectoris may get symptomatic relief from long-acting nitrates or calcium channel blockers. Patients with refractory angina may be treated with combinations of all of these drugs in addition to ranolazine, a sodium channel blocker. The pattern of pain, including OPQRST (onset, provocation, quality, region, radiation, referral, severity, and time), is monitored and documented. Cardiopulmonary status is evaluated for evidence of tachypnea, dyspnea, diaphoresis, pulmonary crackles, bradycardia or tachycardia, altered pulse strength, the appearance of a third or fourth heart sound or mid- to late-systolic murmurs over the apex on auscultation, pallor, hypotension or hypertension, gastrointestinal distress, or nausea and vomiting. The 12-lead electrocardiogram is monitored for ST-segment elevation or depression, T-wave inversion, and cardiac arrhythmias. A health care provider should remain with the patient and provide emotional support throughout the episode. Desired treatment results include reducing myocardial oxygen demand and increasing myocardial oxygen supply. The patient is taught the use of the prescribed form of nitroglycerin for anginal attacks and the importance of seeking medical attention if prescribed dosing does not provide relief. Based on his needs, the patient should be encouraged and assisted to stop smoking, maintain ideal body weight, lower cholesterol by eating a low-fat diet, keep blood glucose under control (if the patient is diabetic), limit salt intake, and exercise (walking, gardening, or swimming regularly for 45 min to an hour every day). The patient is also taught about prescribed beta-adrenergic or calcium channel blockers and any other needed interventions should they become necessary. Four major forms of angina are identified: 1. stable: predictable frequency and duration of pain that is relieved by nitrates and rest; 2. unstable: pain that is more easily induced and increases in frequency and duration; 3. variant: pain that occurs from unpredictable coronary artery spasm; and 4. microvascular: impairment of vasodilator reserve that causes angina-like chest pain even though the patient’s coronary arteries are normal. Severe and prolonged anginal pain is suggestive of a myocardial infarction. I Ordinary physical activity, such as walking or climbing stairs, does not cause angina. Angina occurs with strenuous, rapid, or prolonged exertion at work or recreation. II Slight limitation of ordinary activity. Angina occurs on walking or climbing stairs rapidly, walking uphill, walking or stair climbing after meals, in cold, or in wind, under emotional stress, only during the few hours after awakening, or walking more than two level blocks and climbing more than one flight of stairs at a normal pace and in normal conditions. III Marked limitation of ordinary physical activity. Angina occurs on walking one to two level blocks and climbing one flight of stairs in normal conditions at a normal pace. IV Inability to carry on any physical activity without discomfort—angina symptoms may be present at rest. SOURCE: Campeau, L: Grading of Angina Pectoris [letter]. Circulation 54(3), 522. Copyright 1976, American Heart Association. The symptom of oppression, pain or tightness in the centre of the chest which occurs when the CORONARY arteries are unable to provide an adequate blood supply to meet the immediate demands of the heart muscle. Angina is almost always related to exercise or emotion and is relieved by rest. It is worse in cold conditions and after a meal. The symptom is often described as of a tight band round the chest. The pain may radiate down the arms, especially the left, or up into the neck or jaw. There may be associated breathlessness. Rapidly worsening angina, induced by ever-lessening amounts of exertion, is called unstable angina and requires urgent attention. Angina can be controlled with nitrates, especially nitroglycerine which is best taken in a tablet held under the tongue. The term derives from the Latin angere , to strangle and pectus , the breast. See also CORONARY SYNDROME. A feeling of tightness, heaviness, or pain in the chest, caused by a lack of oxygen in the muscular wall of the heart. William, Sr., English physician, 1710-1801. Heberden disease - small-joint rheumatism, with distal interphalangeal joint nodules and angina. n chest pain, often caused by myocardial anoxia and arterial constriction. Severe constricting chest pain or pressure, often radiating from precordium to shoulder (usually left) and down the arm, resulting from ischemia of the heart muscle. Q. I still have chest pain after 5 angioplasties/stents. Does anybody else still have that much angina? A. my uncle had the same problem. went through several catheterization at several different cardiologist (some are well known), but couldn't get this annoying pain off his chest. the weird part was that it didn't even reacted to effort. but eventually (i don't remember the stent amount) one of the cardiologist solved the problem. so don't give up and continue searching the cause!